Why should International NGOs care about Global Democratic Theory? My colleague Dan Bray has just written a very interesting book with Steven Slaughter called Global Democratic Theory: A Critical Introduction. The book considers why new forms of democracy need to be developed beyond the nation-state and how greater public participation and accountability can be brought to global institutions. In the first part the authors analyse how global dynamics have limited the meaningful choices available to nation states and their citizens, and in so doing have created ‘democratic deficits’. 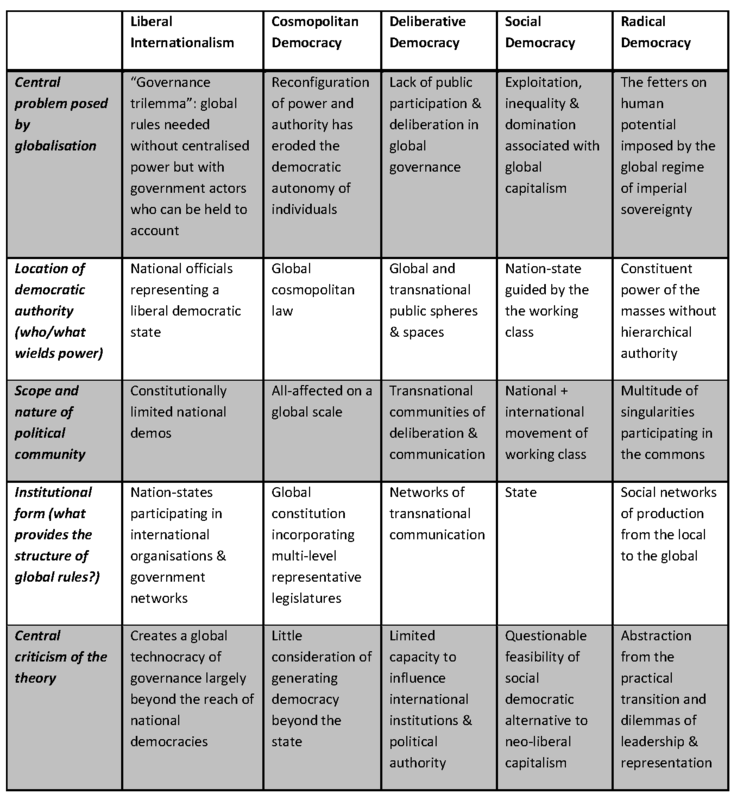 In the second part five main approaches of what they call ‘global democratic theory’ are explored: liberal internationalism; cosmopolitan democracy; deliberative democracy; social democracy; and radical democracy. In the conclusion the authors draw out some of the similarities and differences between these approaches and how current deficiencies are analysed. They summarise this in a handy table – see below. This leads on to an exploration of future possibilities to ‘enable democratic politics with global horizons’. Now at first blush this all looks a bit dry and theoretical. This is after all an academic book. However it seems to me that the book raises a number of questions which are highly relevant to International NGOs (INGOs) for two main reasons. Firstly, INGOs are concerned with precisely the issues that are less amenable to national level solutions. Poverty, inequality, climate change, human security and population movement are all issues which have trans-national drivers and consequences, and for which the limits of national level democratic processes and politics are all too clear. What view do INGOs have about alternative democratic futures? Do they need to be assisting, in the words of Bray and Slaughter ‘to destabilise the notion that elected representation within the nation state is the only way to conceive democratic life’? What vision do they have about how trans-national democracy needs to work? What is the scope of public issues they feel should be subject to democratic control? To what degree are ‘global rules’ and global governance structures likely to be part of the solution, or part of the problem? Are the best pragmatic prospects for trans-national democracy to exemplify what it might look like by building a committed coalition of actors who could combine their political and moral power to democratise a particularly problematic issue or theme? Secondly INGOs are actors in trans-national political processes. The way they function, structure themselves and make decisions is based on certain worldviews about global democracy, whether they realise this or not. As such they contribute to the creation of evolving forms of trans-national decision making. What balance should INGOs seek between holding existing actors and structures to account – and in so doing further legitimise liberal internationalism – or creating alternative deliberative and democratic spaces outside of the formal realm – which would be more akin to deliberative and social democratic theories? What is the experience of INGOs and the partners they support in promoting alternative democratic practices and processes? How far are INGOs exploring and sharing these experiences as part of their contribution to broadening the space for more global democratic practice? How are INGOs’ own organisational structures and decision-making organised? What forms of democracy do they embody? To what extent are they seeking to ‘be the change’ they envision in the world? I would argue that a more considered approach to both these issues is strategic in terms of the issues that INGOs seek to address, as well as potentially offering them some interesting ways of thinking about some of the structural and organisational dilemmas they face. Reading Global Democratic Theory: A Critical Introduction and discussing its relevance is perhaps a good place to start.